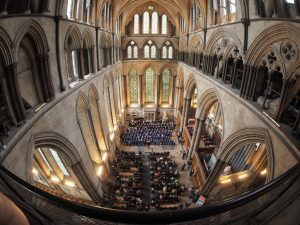 Children from three Wiltshire primary schools made sure the roof was raised at the first-ever concert for Salisbury Cathedral School’s newly founded Voices InSpire project today (Friday, 23 November). Voices InSpire was offered to all local primary schools back at the end of June, and within hours of sending out the information all six places for 2018-19 had been filled. The project kicked off in September with the two schools registered for this term, Winterslow and Old Sarum. Choral animateurs Susie Lamb and Victoria Lane have been going into the schools on a weekly basis to teach them a variety of songs. 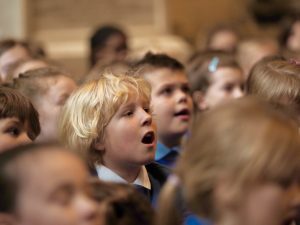 Sponsorship in the form of funding from the JJ Charitable Trust, teaching time from the Cathedral School and use of the Cathedral for concerts has meant that the schools taking part can do so free of charge. This morning’s concert was the culmination of lots of work in all the schools this term and proved to be a spectacular finale for the 150 children taking part. Participation in musical activity has been proven to improve concentration in lessons and raise self-confidence, and as part of such a large choir the children demonstrated terrific teamwork. Susie Lamb, Director of Music at SCS, also runs the school choir at Woodlands and these children were thrilled to come along and support Winterslow and Old Sarum. Afterwards she said: ” It was brilliant and so much fun, the children behaved amazingly and really raised their game so the concert was absolutely stunning. Lots of parents came and there was such a buzz – they even joined in with one of the songs. I am so proud of all the children and grateful to all their staff for their amazing help and support. Over the rest of the academic year, St Andrew’s, Laverstock, Downton Primary School, The New Forest School and Chilmark & Fonthill Bishop are lined up to join the project. Watch this space for further news!